Long fluffy fibres to reach into cracks & crevices. The fluffy head is made of special fibres to trap and hold dust. An extendable handle to dust everywhere, including hard-to-reach places. Ergonomic and foldable handle for comfortable grip and easy storage. Disposable duster so you can just throw the dust away.Pledge Fluffy Dusters are the convenient and effective way to trap and hold dust from your furniture and hard to reach places. The fluffy head, with extra long fluffy fibres, reaches dust in cracks and crevices, so you can clean in all those hard to reach places. 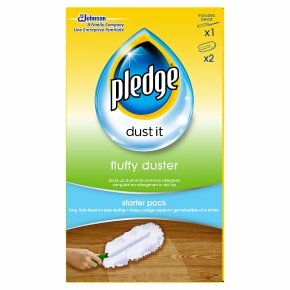 Pledge Fluffy Dusters comes with an extendable and fold-away handle to improve reach into inaccessible places. Usage instructions: 1) Fluff the Duster before use. 2) Unfold the handle. Slide the Duster onto the prongs until it completely fits. 3) Slide the lock at the top of the handle and ensure it is fixed in position. 4) The handle is fully extended when the button clicks into place. Keep out of the reach of children. Do not use on hot surfaces (such as lights etc...) or wet surfaces. Do not use with any other cleaning product or water. Do not flush down the toilet. Do not wash the duster. Wash hands after use.